On February 5, Governor Tom Wolf delivered his annual budget address before a joint session of the General Assembly. For the most part, the Governor talked about his policy proposals in idealistic terms, rather than focusing on the dollars-and-cents line items in his proposed $34.1 billion state General Fund budget for Fiscal Year 2019-20. Essentially, the in-depth discussions about the Governor’s spending plan kicked off on February 19 when the Senate Appropriations Committee opened a three-week series of budget hearings. These hearings gave the Appropriations Committee an opportunity to hear from – and question — cabinet secretaries and other Administration officials about state spending and various policies. I was appointed to the committee for this legislative session so these hearings not only gave me a chance to review the specific budget requests from various state departments and agencies, but provided an opportunity for me to bring up issues that directly impact local residents. These are just a few of the topics I raised with Administration officials during the budget hearings. Videos of these and other discussions are available on my website: www.senatorlaughlin.com. 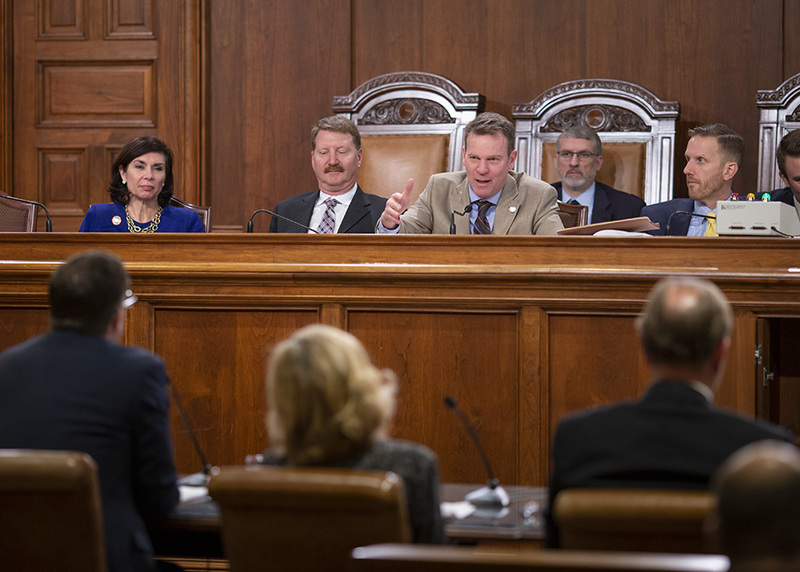 For more information about the budget hearings and to watch complete videos from those sessions please visit www.pasenategop.com. I am joining with the Vietnam Veteran’s Memorial and U.S. Senator Pat Toomey to host the 2019 Veterans Resource and Job Expo on Thursday, April 18, from 1 to 3 p.m. in the Mercyhurst Athletic Center, Mercyhurst University, 501 East 38th Street, Erie. The free Expo is designed to connect veterans and their families with valuable community resources and prospective employers. All proceeds and donations support local veteran memorials. There will be a number of great programs and businesses at this Expo, all of which provide excellent services to our local veterans. This Expo is open to all veterans, regardless of their branch of service or when they served. We appreciate their service and I encouraged them to stop by to learn about all of the benefits and services — from education to health care and housing — that are out there for them. The Expo will also feature my special guest, State Adjutant General (Major General) Anthony Carrelli. General Carrelli is responsible for the command, control and supervision of Pennsylvania’s Army and Air National Guard units, six state-owned Veterans’ homes, and a variety of programs for Pennsylvania’s 800,000 veterans. The expo will provide a unique opportunity for residents to meet the General as he honors local veterans. REAL ID driver’s licenses and photo ID cards are now available to residents who want one. After October 1, 2020, a REAL ID or a federally approved alternative will be required to board commercial flights or enter secure federal buildings. The Department of Conservation and Natural Resources is urging Pennsylvania residents to exercise wildfire prevention vigilance throughout a three-month period when major fires are most likely across the state’s forests and brush lands. Human carelessness continued to lead the list of causes as wildfires across Pennsylvania in 2018. A total of 690 wildfires, ranging from less than one acre in size to almost 690 acres, were reported last year. They consumed 1,843 acres, well below the 10-year average of 4,000 acres. DCNR statistics show nearly 85 percent of Pennsylvania’s wildfires occur in March, April, and May, before the greening of state woodlands and brushy areas. Named for rapid spread through dormant, dry vegetation, under windy conditions, wildfires often scorch 7,000 or more acres of state and private woodlands. Anglers, campers, and other state forest visitors are reminded open fires are prohibited on state forestland from March 1 to May 25, and when the fire danger is listed as high, very high, or extreme, unless authorized by district foresters.